Eolian Residence is made up of several units consisting of one or more rooms, able to satisfy the needs of each of our guests. Extra bed on request with a small contribution. 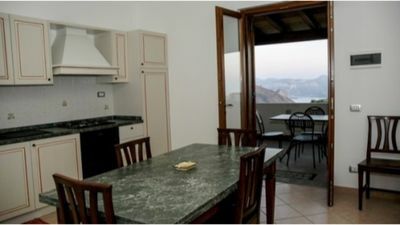 Also in the area of ​​Quattropani there are independent villas with splendid views of Salina, Alicudi and Filicudi. Three-room apartment consisting of two double bedrooms, two bathrooms, living room with full kitchen and sofa / bed. It has air conditioning, a hairdryer, a coffee maker and a TV. It is possible to take advantage of half board at an additional cost of 20 euros per night per person. Full board supplement: € 35 per person per night.